Brexit again leads many of the newspapers, after the EU agreed to postpone the UK's leaving date late on Thursday night. "One last chance" is the headline in the Times. "A three-week lifeline" for Theresa May is how the paper describes the agreement over the Brexit delay after hours of wrangling in Brussels last night. 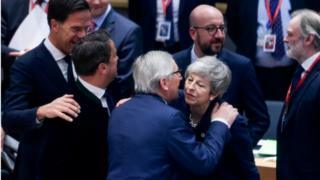 The paper claims EU leaders were unimpressed by the case presented by Theresa May, with one reported to have described the prime minister as "evasive", "without a plan" and "confused'. The Guardian also runs with the theme claiming: "May's appeal falls flat as EU seizes control of Brexit Date". It says the prime minister's failure to provide clarity on what would happen if she lost a further vote on her deal "provoked" EU leaders into taking matters into their own hands - in effect taking control of her future. And it is that future which occupies the Daily Telegraph as its headline proclaims: "Clock runs down on May". The paper reports that the chairman of the 1922 Committee of backbench MPs, Sir Graham Brady, visited Mrs May in Downing Street earlier this week to make it clear that a growing number of MPs believed she should stand down over her handling of Brexit. The Daily Mail provides a crumb of comfort for Downing Street. Alongside the headline "May calls EU's bluff on no deal", it argues that the prime minister's "tough stance" in warning that the UK was ready to implement a no-deal Brexit next week forced EU leaders to be more conciliatory. Meanwhile, "battle plans drawn up for no deal" is the headline in the Express. The paper reports that Cabinet Office officials are preparing to launch a civil contingencies programme called Operation Yellowhammer to implement a new command structure across Whitehall. "Brextra time then penalties" is the Sun's headline. It suggests Theresa May endured "humiliation" after being forced to wait outside a summit room for hours as feuding EU leaders "carved up Brexit's timetable without her" over dinner. In fact, the paper claims, the PM was sent her own solitary meal on a tray as she waited. A poignant photograph of a family using an emptied fridge as a raft to survive in flood waters in Mozambique features in many tabloids and broadsheets. The Telegraph reports that rescue efforts may be too late for many stranded by flood waters following Cyclone Idai. It carries the account of an eyewitness who says he counted bodies along a 15-mile walk to safety and estimates that he saw around 400 people dead. "Mums are throwing babies out of trees" is the stark headline in the Mirror. It warns that UN officials believe it could be the southern hemisphere's worst weather related disaster. The Express carries the extraordinary tale of how a Second World War hero from York will finally receive a proper burial, 74 years after his death. Spitfire pilot John Henry Coates - known as Harry - was downed in 1945 as he flew an operation near Venice. His remains were found when a team of archaeologists unearthed his plane on a dig for historical aircraft in 2017 and his identity's since been confirmed by DNA testing. He will be given a full military service at Italy's Padua war cemetery next week and his niece, Helen Watts, told the paper she was "delighted" he was finally getting the hero's burial he deserved.